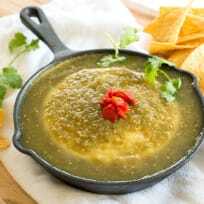 Tantalize your taste buds with this queso fresco baked in salsa verde. A super easy 2-ingredient appetizer that can be baked in the oven or cooked on the grill! Chicken Fajita Salad - a hearty salad topped with grilled chicken, peppers, onion, avocados, and a salsa vinaigrette dressing. Definitely not your average salad! 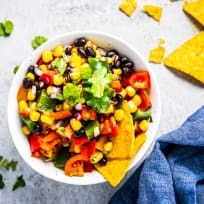 Grilled Sweet Corn Salsa is a naturally gluten-free sweet and spicy dip or relish you’ll want to make all summer long. It’s your new favorite salsa! These salsa recipes come with a WARNING: You may injure your wrist after dipping into them so many times. You won't be able to stop! Strawberry Salsa Chicken should be on your seasonal dinner menu. The sweet burst of flavor complements seasoned seared chicken. Crispy Crab Cakes with Avocado Grapefruit Salsa make a wonderful summertime appetizer or even light lunch. 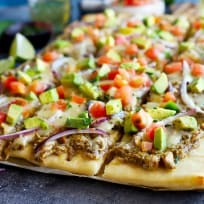 You’ll really wow your guests with this one! 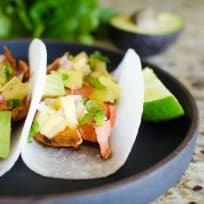 Fish tacos with tropical vanilla salsa are the perfect summer supper. Serve them up at your next big barbecue, because everyone’s tired of burgers, y’all! Fruit salsa with cinnamon wonton chips is quick and easy, the perfect healthy snack. Plus, it’s great for packing in your lunch!